Douglas County was investigating the possibility of locating the proposed community center on County property south from Lampe Park and adjacent to Waterloo Lane in Gardnerville, Nevada. The project site was located in a primary FEMA designated floodplain. R.O. Anderson was retained to complete a feasibility-level analysis to determine the potential impact on the Special Flood Hazard Area of Cottonwood Slough by placement of the proposed community center on the Douglas County site. Because downstream structures are impacted by the effective SFHA, no increase in water-surface elevation is permitted by FEMA. R.O. 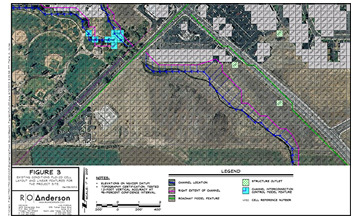 Anderson utilized the FLO-2D two-dimensional hydraulic model that was prepared as part of the Manhard Pine Nut Creek hydrologic and hydraulic analysis executed for the Town of Gardnerville. Using guidance provided by Douglas County personnel and their architectural consultants, R.O. Anderson adjusted the FLO- 2D model to block out cells impacted by the proposed structure and filled area of the parking lot. Using the revised bathymetry, the model was operated and results extracted. R.O. Anderson analyzed several potential alternatives that could be used to mitigate the downstream impacts on the Cottonwood Slough/Martin Slough floodplain. Potential impact to the floodplains of the Cottonwood Slough and Martin Slough was such that a rise in base flood elevation of about 0.1 feet could occur to those structures downstream from the site and adjacent to Lampe Park. The results and recommendations were presented in a report to the Douglas County Parks Department. Based on the findings of the R.O. Anderson study, location of the proposed Douglas County Community and Senior Center is feasible from a flood hydraulics perspective. R.O. Anderson prepared and submitted a formal Conditional of Letter Map Revision application to FEMA to document the results of the two-dimensional modeling and prove that the impacts from the project were mitigated with the design. Ultimately, a Letter of Map Revision application will be completed to officially document the change to the floodplain caused by the improvements. 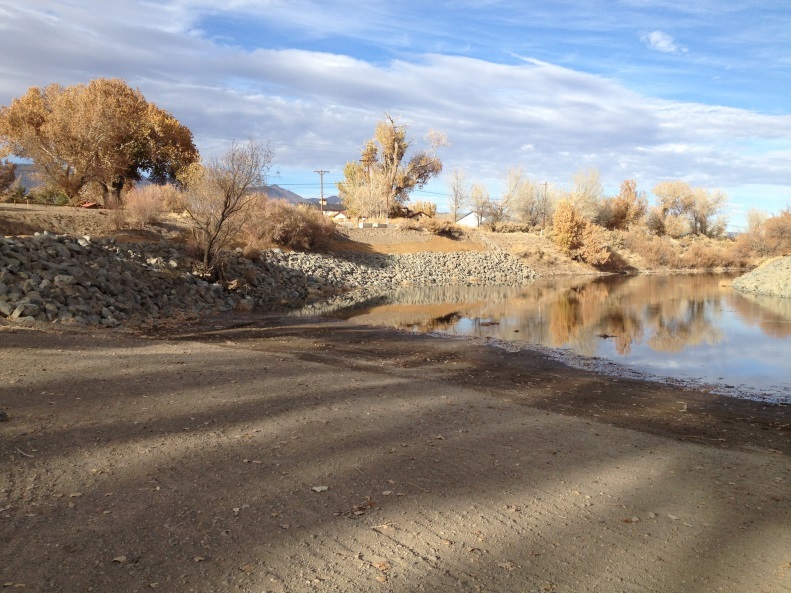 The number of proposed projects along Martin Slough and post-FIRM changes to the Martin Slough floodplain were such that Douglas County, Nevada engineers determined that updated maps of the regulatory floodplain for Martin Slough were necessary. 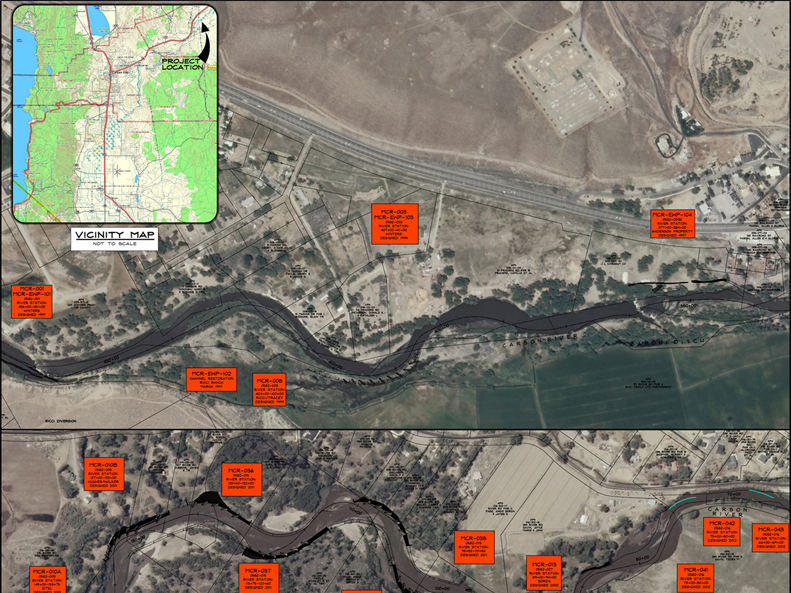 The original mapping was done for the Federal Emergency Management Agency (FEMA) by a contractor, probably the Sacramento District of the U.S. Army Corps of Engineers (USACE). Furthermore, existing conditions near the downstream end of Martin Slough were such that a significant fraction of the base flood discharge is diverted by U.S. 395 north along the east side of the highway. This represents a substantial difference from the formulation of the original modeling. R.O. Anderson developed an existing conditions model (meaning a current conditions model) and prepared a Letter of Map Revision for the study reach. 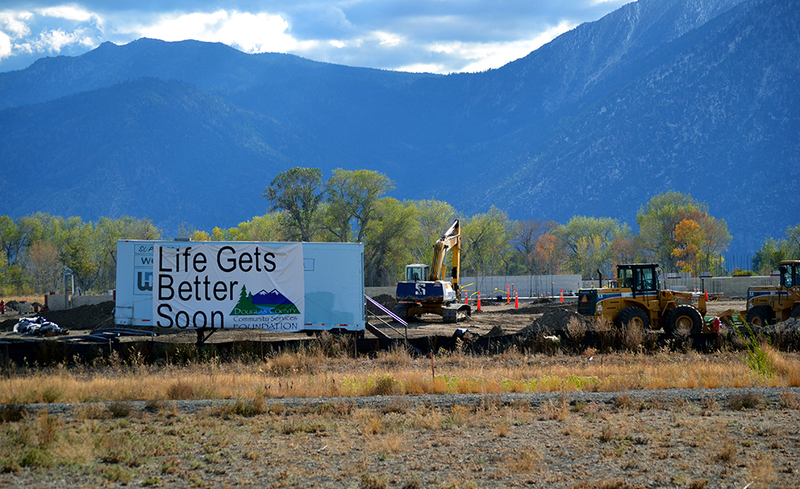 The project was amended to include an approximate analysis of the reach downstream from U.S. 395 to East Fork Carson River and development of a floodway for remaining parts of the study reach of Martin Slough. LiDAR topography supplemented with field surveys was used to develop a suite of models of Martin Slough. The suite of models included an existing conditions model (as well as a duplicate effective model) using more than 80 cross sections for the analysis. Completion of the project resulted in presentation of a report and supporting materials for application for a Letter of Map Revision (LOMR). The materials were reviewed by FEMA and a LOMR was issued for the study reach of Martin Slough. The provisional flood insurance study (FIS) and associated Flood Insurance Rate Maps (FIRMs) were received by Douglas County, Nevada in April 2008. Proposed changes to significant portions of the regulatory floodplain resulted in concern among many private citizens. We performed a technical review of the methods used to revise the FIS and the FIRMs. As a part of the FEMA review, five watersheds along the eastern side of Carson Valley were restudied. A report was developed and submitted to Douglas County, Nevada. The purpose of the report was to document the findings of the R.O. Anderson review for submission to FEMA as part of their public-review process. The results of the submission of materials to FEMA are not known at this time. A long-standing design problem involves dealing with the joint probability of flooding at locations where two streams join. That is, the probability of a particular event is not simply the probability of the event on one stream or the other in the region near the confluence of two streams. Dr. Thompson, in conjunction with Roger Kilgore (Kilgore Consulting and Management) and Dr. David Ford (Ford Consulting Engineers), developed tools for application of two-dimensional copula technology for estimating the joint (or concurrent) probability of flooding at the confluence of two streams. The results were presented in a report to the Transportation Research Board for national dissemination to hydraulic engineers tasked with designing crossing structures for highway projects. Texas Department of Transportation issued a research contract to determine the genesis of the motion of bed materials at stream crossings and to develop potential solutions to the problem. Dr. Thompson served as research supervisor for this project. A combination of fieldwork, numerical modeling, and physical (laboratory) modeling was undertaken to understand the mechanics of bed mobility and the relation between the structures used for crossings with the stream and bed materials. Based on study results, the research team recommended that TxDOT engineers develop designs to allow passage of granular materials over the crossing and reduce the hydraulic impact on flow dynamics. 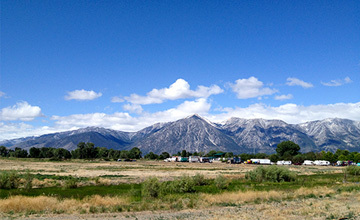 An 8-mile reach of the Carson River within the Dayton Valley exhibited a series of bank failures. 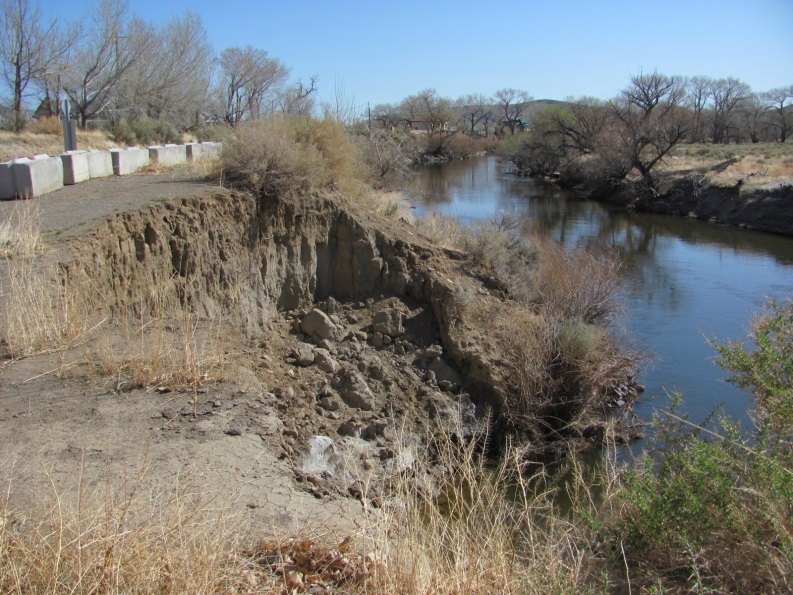 Property owners along the Carson River were experiencing significant annual erosion of valuable agricultural lands and needed to find viable long-term methods to minimize erosion from annual stream flows. Over a period of years, a number of stabilization projects were designed and constructed. Dayton Valley Conservation District (DVCD) implemented several different solutions on an ad hoc basis, but had no method for ascertaining the effectiveness of any or all of these solutions. We assessed the utility of the applied approaches and make suggestions for appropriate application of bank-protection technology. Our research included an aerial survey of the reach and preparing a hydraulic model to determine depth of flow for various discharge rates/recurrence intervals. After completion of a detailed five-year monitoring program, analysis of river morphology changes at about 40 cross sections at specific and repeatable locations was completed. I final report documenting the monitoring results and interpretation of measurements was prepared and delivered to the client and other sponsoring agencies.